Small - $32.99 Medium - $32.99 Large - $32.99 X-Large - $40.99 Only 6 left! When we hear about voodoo dolls, we usually hear about the bad stuff. Folks are ready to assume you're buying a voodoo doll to bring negativity down on some unfortunate soul's head. You know the scenario. Bob the boss sacked Nancy so she goes out to the local witch doctor to whip up some vengeance. The thing is, voodoo can be a lot more positive! In fact, when witch doctors came up with voodoo dolls, they were supposed to heal. If someone had a stomach ache whoever had the doll would poke a pin into the belly of the voodoo doll to transfer the pain. That's a pretty good deal if you ask us. But who are we kidding, dark voodoo dolls that are made for creative revenge are so much more fun! This costume is the perfect balance of dark and sweet. The featured dress has puffed sleeves with a square neckline. The dress has stitches along the waist. The uneven hem is tattered and has tulle underneath. Patches and stitches are printed on so it won't fall apart after the first wear. When your little one dresses up as a Voodoo doll, you're sure to wonder at how magical she looks! You can even make the costume into a group ensemble. Mom and dad can dress up in witch doctor costumes to control the spells. Halloween is sure to look perfectly picturesque. Do you want to polish off this look? Add stitched tights, a doll wig, and makeup stitches on your child's face. 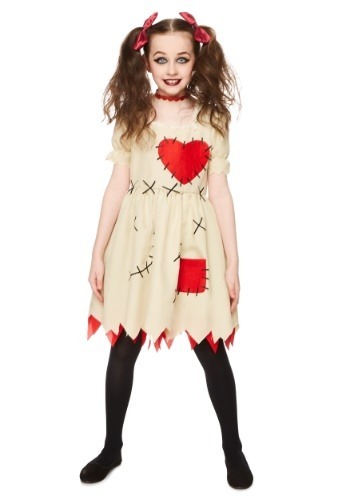 Whether this doll is used for good or bad, this costume will be a Halloween look your kiddo will never forget! Just remember to be extra nice. You don't want to incur that voodoo wrath... just in case.